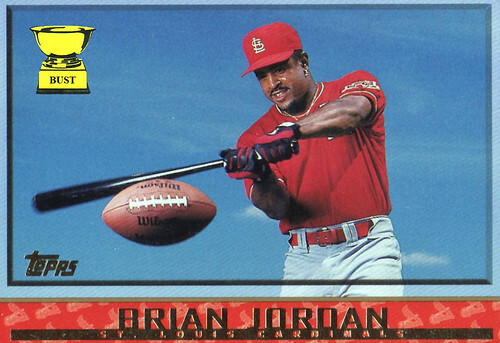 We'll take a pass: Brian Jordan was a two-sport athlete for several years, playing defensive back for the Atlanta Falcons while climbing the St. Louis Cardinals' farm system. He even led the Falcons in tackles in 1991 and was a Pro Bowl alternate. But he signed a contract with the Cardinals in 1992 that required him to quit football (except for ridiculous baseball card photo shoots, apparently). Here are a few of the Bust's other favorite two-sport stars.